It must have been good at last night’s caravan park because, despite going to bed by 8pm, we slept in until 7.30am! Yesterday’s 105kms must have done us in! The fact that it kept drizzling probably soothed our subconscious (although, there’s nothing too soothing about camping in the rain!). We waited as long as we could, but even though it stopped drizzling, we had to pack up our tent while it was still wet and head off. It is only about 70kms from Portland to Port Fairy along the Princes Highway. We were grateful to have a shoulder and much less big truck traffic. Being a Sunday, we were hoping the traffic would be light overall, and we found this to be the case. 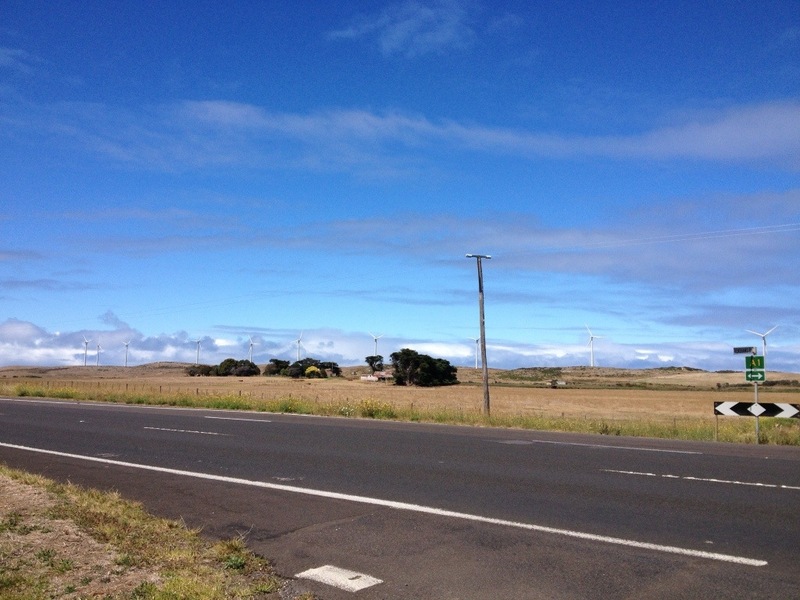 The energy levels were light too, and we looked forward to reaching Port Fairy. Codrington Wind Farm, you could hear the big blades as the wind turned them around. A woman in Mount Gambier told us the coffee was good at ‘Rebecca’s Cafe’ in Port Fairy, so, when we eventually rolled into town, we headed straight there. The cakes and biscuits are made in-house so we had to sample them too. It wasn’t until after we had dived into and polished off two generous pieces of cake and a ham and salad baguette that we thought about taking a photo. It would have been worth it! 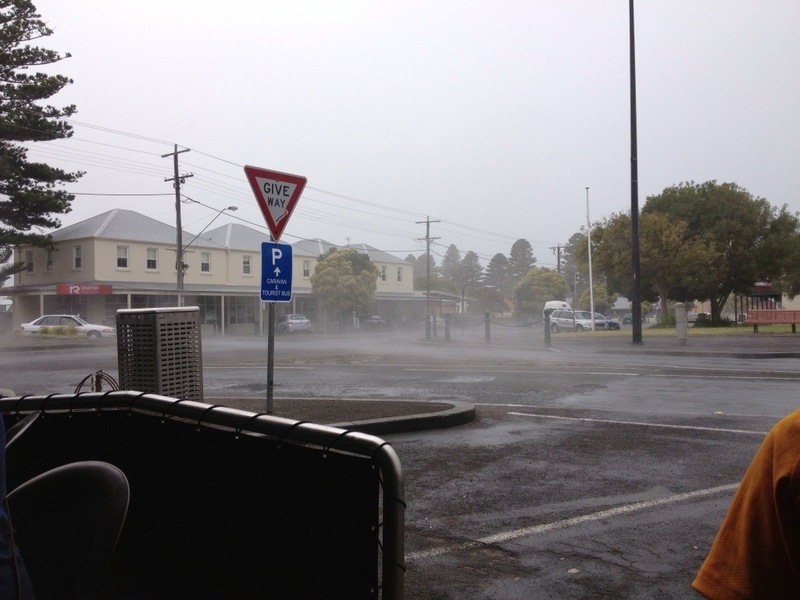 While we sitting at the cafe it suddenly started to rain and the steam rose off the road. With a forecast of more showers, an already wet tent and a pile of washing to do, we took the soft option and booked into a lovely B&B for the evening. It was absolute luxury with views of the river, comfortable couches and a welcoming host. 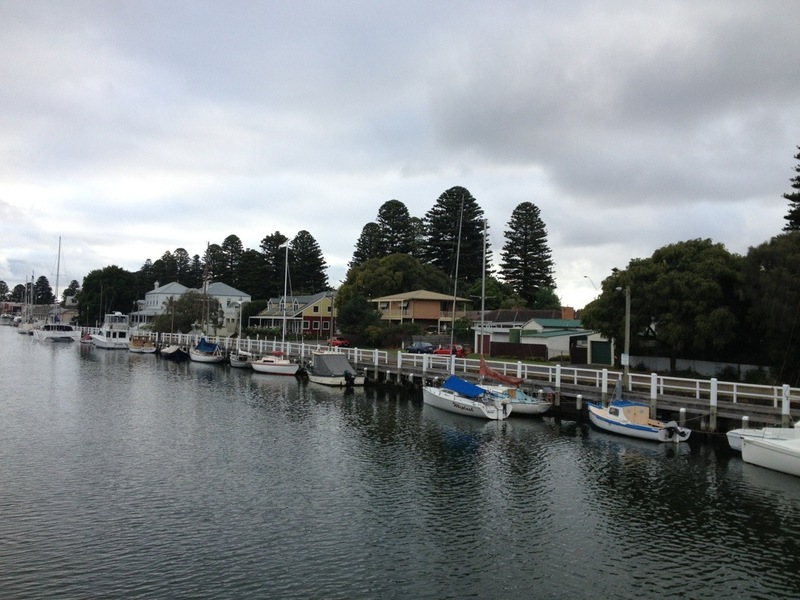 Port Fairy was beautiful with lots of heritage buildings along the river and the beach. Funnily enough we met a couple from Hobart while in Port Fairy and learnt that the tan line from our knicks is supposed to be perfectly straight and even on both legs. I guess we fail that one! We also got some helpful directions on how to avoid much of the highway to Warrnambool tomorrow. Of course the rain stopped for the evening once we paid our money for the accommodation, but it was so nice being in pleasant surroundings we didn’t really care!